Hi everyone! 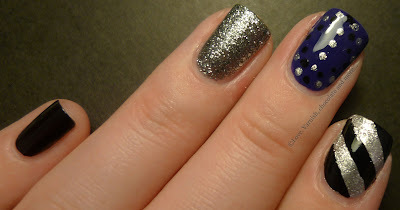 No, Bregje didn't change her nails or hands, it's a guest post today! Some of you may already know me and some of you may not. My name is Deborah and I am also a blogger. Bregje and I are both from The Netherlands and both hang around on the same Dutch forum (the forum that caused my addiction actually). When she started blogging I loved it immediately, how could I not when looking at her nails and skills? She was sweet enough to invite me over for a guest blog so I decided I wanted to do something different, something new even. I present you: my first skittle manicure! I've seen skittles like these before and usually they are created with soft and light colors. 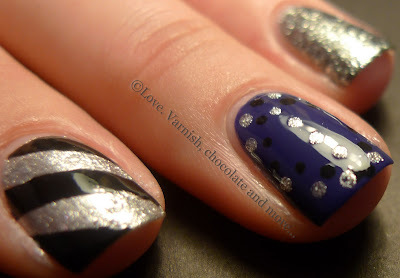 I wanted to create something more suiting the holidays so I used more silver and dark colors. So what do you think? Do you like these skittles? Thanks so much Bregje for this opportunity! Deborah's pics are always easy to recognize thanks to her unique way of taking them, and this way she shows fab swatches and great combos on her blog!